Designed by the famous golf player Bernhard Langer, the golf club is accessible to players of all levels. The course covers 38 hectares on the southern half of the Ile aux Cerfs Island with the holes snaking up and down the length of the island, boasting naturally in the undulating topography with volcanic rock outcrops, lakes and gullies, and a variety of tropical trees and plants. All 18 holes of this island golf have views of the ocean – some with glimpses across clearings through the trees; others by coming close to the shore. Expansive white sand bunkers and water set off the natural backdrop of trees and vegetation perfectly. Water is an essential feature of the course. There are nine lakes in all, and three of the holes require tee shots across sea inlets to the fairways. The luscious turf is Salam Seashore Paspalum grass, which is resilient in the tropical climate and allows the highest standards of course conditioning. major changes will enable golfers to discover a more accessible golf course, regardless of the golfer’s level. The unique island golf course of Ile aux Cerfs will definitely be one of the most stupendous golf courses in the world, a “must play” as Colin Montgomerie puts it. In 2019 IAC was listed among World’s Top 100 Golf Courses by Golfscape. The golf club is accessible to players of all levels wishing to play golf in Mauritius. The course has been designed to challenge advanced players as well as to remain exciting and playable for recreational golfers. In 2013, upgrading works have been carried out on the front nine holes in order to offer a better golfing experience to golfers. In June 2014, the back nine holes have started to be reviewed and upgraded. These major changes will enable golfers to discover a more accessible and enjoyable golf course, regardless of the golfer’s level. 78-seat restaurant and bar with panoramic views of the course, the ocean and distant mountains. This magnificent white sand beach dressed with trendy sunbeds and beach parasols for your pleasure. Enjoy a succulent seafood lunch together with a personalised beach butler service. A refreshment cart service is available on the golf course. Golf carts are equipped with their own cooler boxes. Golf carts are equipped with Visage GPS and are chargeable as per conditions. Well-equipped Men's and Ladies' locker rooms with changing and shower facilities. Bag storage space is available for members, visitors and guests of Sun Resorts properties, Shangri-La's Le Touessok Resort & Spa and of Anahita The Resort. Clubs and shoe rental. Mens & ladies clubs for right and left-handed players. Each hole has a minimum of 4 Tee decks: Langer, Championship, Tournament and Forward. Full driving range with target greens, putting greens, chipping and bunker area. Please note that Hollow Tining will be held on 26th of May and 04th September 2019. All green fees include boat transfer. Sun Resorts guests benefit from preferred access to the golf course. Golf shoes with soft spikes are compulsory on the golf course. Regular golf attire is required, including shirts with collars, tailored trousers and Bermuda shorts. No denims, beach wear, tennis wear or training shoes are permitted on the golf course at any time. Book your once in a lifetime experience where golf and gastronomy meet on the paradise Mauritius. Overlooking the 18th hole, the Golf Shop has everything needed to have a great game of golf. Whether you visit the shop because you need an item or simply to browse, you will not leave this golf shop empty-handed! Offering sales and hire, The Golf Shop provides a full range of golf clothing, shoes, souvenirs and premium equipment. Your purchases are duty free. 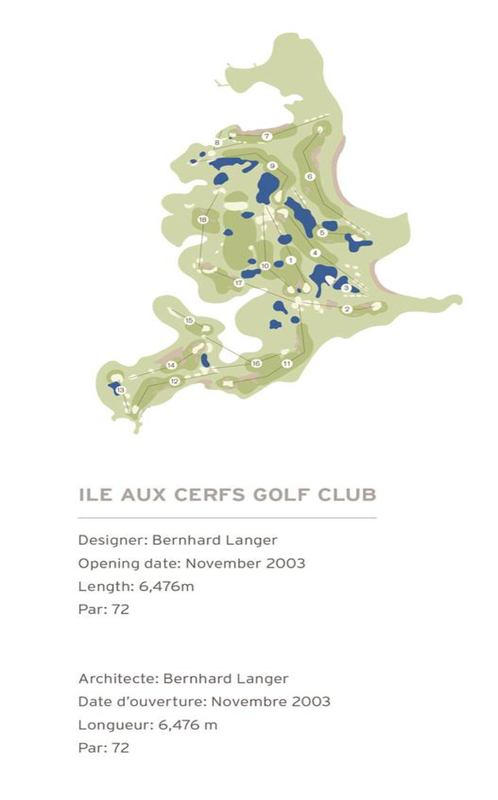 Ile aux Cerfs Golf Club will undergo the annual maintenance on 26th May 2019 and 4th September 2019. The front 9 which will be closed on the first two days and golfers will be able to play the back 9 twice. After this period, the front 9 will be opened and the back 9 close for two days. The golfers will be able to play the front 9 twice when the back 9 is closed. After the 4 maintenance days, the 18-holes golf course will be open and tees and fairways will be hollow tinned around the golfers. These works are essential to ensure the best possible playing surfaces all year round. We apologize for any inconveniences caused to our guests.